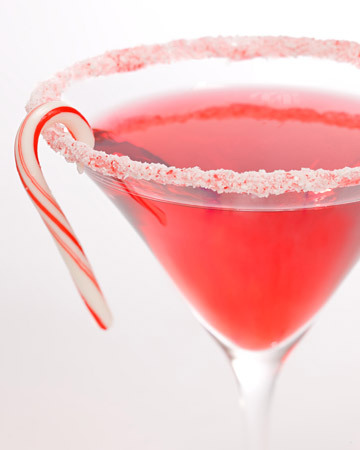 So you're probably onto your upteenth holiday party, family get-together, cookie-swap, cocktail hour, winter-gorge-fest and it's only mid-December, right? And just about now you're starting to panic. Your sweet tooth has a death grip on your afternoons and you're looking down the barrel of another boozy evening with friends. Forget freshman-15, you're in full-on-holiday-fat-gaining-beast-mode. Right? Well...maybe not. There may in fact be hope at the of your wine funnel. While you may feel like you are gaining at least five pounds a day, it's most likely in your head (so far...the holiday social season has barely begun, after all...). In fact, a new study shows that, while most people think they've gained weight between Thanksgiving and New years, the majority in fact, do not (phew!). Unfortunately (major bummer alert), this new study is in some pretty serious competition with previous research that shows gains between 1-3 pounds throughout the holiday season. Bah! So, which study is to be believed? Can you really stave off holiday weight, even with the endless amounts of social events that you *must* attend. Seriously, it would simply be rude to not have a cocktail and sample the hors d'oeuvres...rude. Well, as it turns out, the nutrition world is coming around to the idea that weight gain, like weight loss, is actually a fairly slow process. Unless you are truly stuffing your face with 4,000 cals every 24 hours while sitting exclusively on the couch ALL day, you are most likely gaining less weight than you think. In fact, the majority of your holiday bloat is probably water weight from excess salt intake interpreted by a fuzzy head due to lack of sleep. 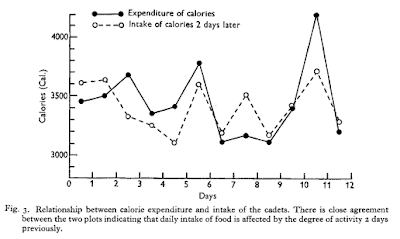 Some pretty sophisticated mathematical models are actually showing that there are ebbs and flows to weight gain and loss (shocker...). I know myself, that I weigh between 108 and 113 pounds on any given day and this fluctuates from morning till night till morning again. (FYI: Just to give you a little perspective on that weight, I am 5'1" on a TALL day...). 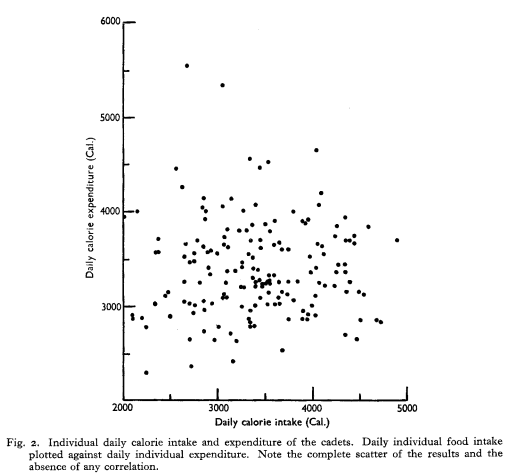 The take-home message here is, on a daily (or even meal-to-meal) basis you may take in more or less calories than you expend in those hours of the day. But, if you look at this intake and output over a fairly long period of time, most people tend to compensate to remain around a pretty steady set-point. So, when do you need to worry? Well, take me, for example. If my own weight fluctuates between 108-113 lbs on a fairly regular basis, and I started seeing 114, 115, or 116 more often...I might start to rethink my diet and exercise routine. But, here's the thing, I don't own a scale. When I say that my weight fluctuates, I'm talking about weight that I see when I'm at a hotel with a scale in the bathroom or in a gym locker room (...and I don't belong to a gym, so that's pretty much never). All-in-all, I probably weigh myself 2-3 times per month. But, that's when you start noticing a change...longer term. Stressing about a pound on Tuesday when you just weighed yourself on Monday is useless. Go to the bathroom and you'll be back down a pound. Just remember, the holidays happen once a year. They are a time to enjoy the last 350 days that you have lived and to appreciate all the work that you have done. If, during this festive time, you are constantly stressing about what you are putting in your mouth and dreading the cold hard stare of the electronic numbers under your feet, you're missing the point. If you feel stressed, go for a run. Breath in the cold air, sweat out the anxiety. In fact, go for a run or practice yoga or do a stadium or sweat it out in a spin class....just because it's good for you. 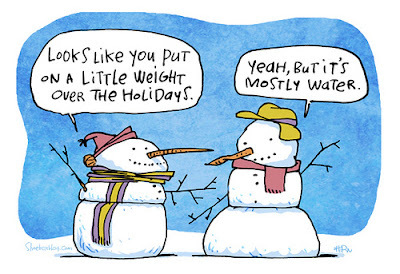 Even the worst case scenario studies say that you may only gain 1-3 pounds in the three weeks between holidays. And don't forget, none of these dooms-day studies followed up with their subjects after the holidays were over. So, should you compensate for your festivus feasts? Of course...as you normally would. Eat a salad for lunch. Drink only water during the day. Take the stairs. Keep up your exercise routine. When you're out, eat good food and drink quality wine. 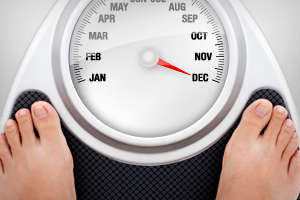 Mindfully enjoy this time of year and then check your weight again in mid-January. Until then, chill out. 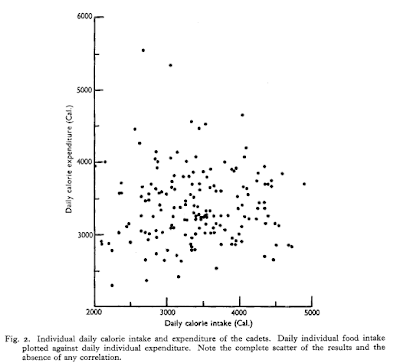 Older PostNutrition is Science, Don't Let it Confuse You.